The "devices & services strategy", as coined by Steve Ballmer, has long been my pet peeve. This is because it clearly attempts to conflate two business models that are diametrically opposed to one another -- monetizing hardware vs. services. While my initial analysis focused on Microsoft, this applies to other companies as well. Of course, this hasn't stopped analysts from arguing in favor of the very same "devices & services strategy" for Apple. The lack of specificity in this argument has always amused me. So let's be specific and look at the avenues available to Apple for monetizing services. This category refers to activities reported under iTunes / Software / Services in Apple's financial reports. Apple has sold apps through iTunes for about 6 years now, and video/music content for much longer than that, so their current financial impact should be fairly representative. Over the past 12 months, this segment generated $17.7 billion in revenue at an estimated margin of roughly 10-15%. In other words, it generated just 10% of Apple's revenue and possibly just 5% of their operating profit. The only comment from Apple on services margins came in 2011, when they mentioned that the App Store runs just above break even. Also, consumer services like iCloud Drive are meant to lock users into an ecosystem. If Apple's goal was to profit from this service, it would have no interest in undercutting rivals like Box and Dropbox. Google Drive for consumers follows a similar philosophy. Apple has always used iMessage as another way to tie users into their ecosystem. Free SMS to other iOS users was very valuable but other free, cross-platform messaging apps have emerged. These apps, including LINE and KakaoTalk, have been very successful at monetizing their user base. How successful? They generate roughly $2 per user in a year, including all revenue lines. If Apple could match that across their user base, they could generate $1 billion in revenue -- that adds about 0.6% to their revenue. But there may be a slight hitch. As of today, social gaming accounts for the majority of the revenue generating by messaging apps. The apps present a curated selection of games to their user base in exchange for a revenue share. Something tells me that developers won't be very enthused about giving Apple an additional revenue share, on top of the standard 30% paid to the app store. All of a sudden, even that 0.6% of incremental revenue looks challenging. There are two other monetization models included in that $2 ARPU figure, but these have broader implications as well -- mobile payments and advertising. Apple has been rumored to launch a mobile payments service in the near future. Getting into payments makes perfect sense from Apple's perspective because, again, it helps tie users to their ecosystem. If that is the goal, Apple could again attempt to undercut standalone services like Paypal. But for now, let's ignore that. In 2013, Paypal generated $6.6 billion in revenue by processing transactions worth $180 billion. Of these transactions, $125 billion were processed under the Merchant Services division. Apple is very unlikely to manage payments for third parties, so their average fees should be lower -- but let's ignore that as well. In 2013, mobile commerce was responsible for ~$40 billion in sales, and is expected to surpass $50 billion in 2014. Of these, the iPhone held ~50% of phone transactions and the iPad held ~80% of tablet transactions. Even if Apple rolls out their mobile payments feature, it is unlikely that they will "own" all payments made on iOS devices -- for example, Amazon is unlikely to use Apple's payment system. But for now, let's ignore all of that and assume that Apple can process transactions worth $50 billion (or $100/user) with their payment system. Using Paypal's revenue to transaction ratio as a benchmark, Apple should generate $1.8 billion in revenue -- or 1% in incremental revenue (at margins below company average). Of course, the challenges don't stop here. Payment providers like Paypal have been facing margin pressures because of increasing competition. As a result, they have looked towards leveraging payments data to boost revenues. How can payments data be leveraged? You guessed it... advertising. All roads lead to Rome, and all attempts at monetizing services lead to advertising. This is the last remaining avenue to monetize eyeballs across services like iMessage and Apple Maps. In messaging, this could mean direct to consumer messaging or offers through brand accounts. With maps, this could mean featured listings, etc. Because of high user engagement, Facebook has become the gold standard in mobile advertising and generates roughly $6 in annualized ARPU. Of course, this is only possible because they have deep relationships with large brands and a self-service system for targeting the long-tail of SME advertisers -- very important for scale in the digital advertising business. Let's assume that Apple can expand iAd or create a parallel organization to manage this hypothetical advertising business. Let's also assume that Apple can somehow match Facebook's ARPU through ads on Apple Maps and iMessage, using iBeacon for location targeting. Earning $6 in revenue per user, across 500 million users would generate revenues of $3 billion -- or 1.7% in incremental revenue. 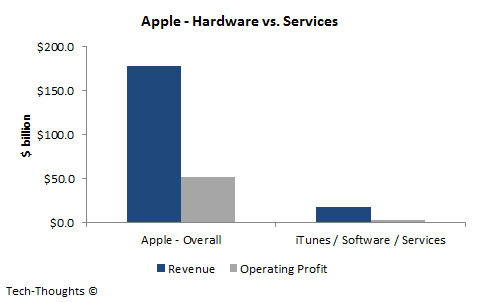 If Apple somehow manages to accomplish everything we've discussed, they could generate incremental revenues of roughly 3.3% from services. Seems like a lot of work for barely moving the needle. If their goal is to maximize revenue potential from services, they should be following a "Google-like" approach to ubiquity. More users, more eyeballs, more revenue. One way to be present everywhere would be to target lower price points and license iOS for free to other OEMs. I may be going out on a limb here, but I don't see that happening. Instead, based on their recent hires, Apple seems much more interested in becoming a manufacturer of fashion/luxury goods -- a strategy that's far more aligned with their focus on high-margin hardware. That shouldn't be surprising.